"The mission of St. Jude Children’s Research Hospital is to advance cures, and means of prevention, for pediatric catastrophic diseases through research and treatment. Consistent with the vision of our founder Danny Thomas, no child is denied treatment based on race, religion or a family's ability to pay." The snowman ornament is approximately 2 1/2" x 2" and casted in resin and is available in Gold Glitter, Red, or Green. The mold was created from an A.J. 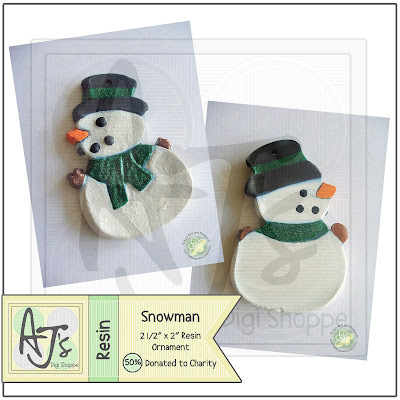 's Arts and Design Original Paperclay ornament. Each ornament has been hand painted meaning no ornament is exactly alike. Each ornament come with a tag explaining the charity and a ribbon to hang the ornament.